Wholesale Trader of a wide range of products which include fingertip pulse oximeter, ftp201 fingertip pulse oximeter, ftp301 fingertip pulse oximeter and ftp401 fingertip pulse oximeter. • Battery Voltage Indication Color OLED Graph. • Compact Size Friendly Operation Menu for the Function Setting. • Power Consumption less than 20 mA (Wireless and Alarm not work). • Resolution 1% for SP02 and 1 BPM for Pulse Ratio. • ±2BPM or ±2 %( Select Larger) for Pulse Ratio. 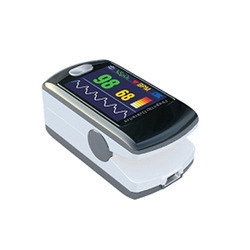 • The fingertip pulse oximeter can monitor SpO2 (Oxygen Situation Level) and PR (Pulse Rate) through patient’s finger. • This device applicable to home health care, Hospital, Oxygen bar, Community, Medical Center, before or after sports and so on.